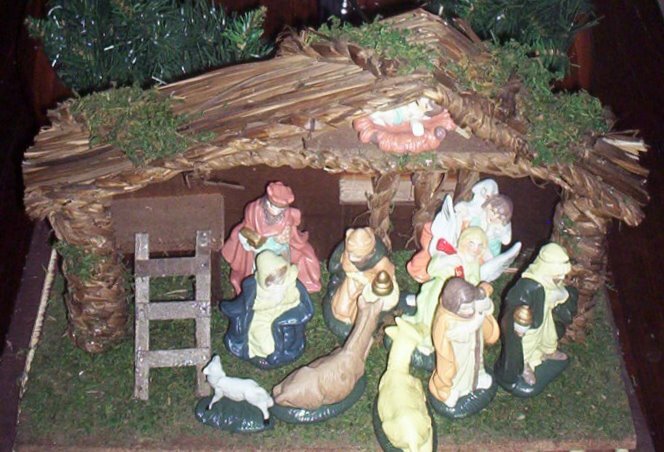 The children love to play with this nativity scene. In case you are wondering, baby Jesus is up in the hay loft. I must admit, I hesitate to write this post knowing that many readers will disagree and perhaps even be offended. I apologise in advance to anyone who is offended but think that the topic is important enough to broach. I hope you will approach what I have to say with an open mind and make your own judgements based on biblical understanding and after prayerful consideration. With Christmas decorations hitting the shops, I have turned my thoughts towards this year’s Christmas celebrations and plans. Is it possible to celebrate Christmas with Father Christmas or Santa Clause and still be honouring to God? Can we participate in all the pretend and story telling that goes along with it without lying to our children? How can it be ok to deliberately lead our children to believe that something is true when it clearly is not? The bible tells us that God is truth and Satan is the Father of lies. (John 8:44) Is it all just harmless pretend and imagination, or has it gone one step further than that? We teach our children that being truthful and honest at all times is right and pleases God and tell them that pretending is fine as long as others know you are pretending. If our children report an event or happening to us that is not true, without making it clear that they are “telling us a story” or “pretending,” we treat this as lying and give appropriate consequences. I can’t reconcile that standard with telling them the traditional Santa tales, knowing that they fully believe every word of it to be true. Why do many of us celebrate Christmas with the Father Christmas myths as a central part? For most of us, we grew up with it and loved every minute and our families (parents and extended family) may be upset if we decided to make a change. Many also seem to think that their children will miss out on the “magic” of Christmas. Some say they grew up with Santa and are still Christians so therefore there is no harm at all in doing it with their own children. We are living in a time when reportedly up to 80% of those making decisions for Jesus walk away from the church or “backslide” as we often term it. Why take the chance with anything at all that could potentially harm our children’s faith? We all know there will come a time when children will work out for themselves that Father Christmas isn’t real, but after years of hearing from trusted parents that he is real (and often that the Easter bunny and tooth fairy are also real), is the next step to question whether Jesus is real or just another pretend that Mum and Dad have told over the years? At this time of year it’s hard to steer clear of the commercialism of Christmas and keep the focus on celebrating Jesus’ birth where it should be, without adding reindeer stories and Father Christmas into the mix. We feel that we can still make Christmas a wonder-filled time of joy and fun without involving Father Christmas at all. We do give gifts, but the focus is on celebrating Jesus’ birthday and the tradition of gift giving started by the wise men at Christ’s birth. We have a tree, but it is a Jesse tree with the symbols on it related to bible stories. We spend time together making decorations and dressing the tree, eating special Christmas treats and listening to joyful Christian Christmas music. We have an advent wreath with candles to light as we read Christmas devotions and other special Christmas stories set aside for just this time of year. We cook together, hold family get-togethers, feasts and invite special visitors and are endeavouring to build many other Christmas traditions to knit us together as a family. Our children love Christmas and look forward to it with as much joy, anticipation and excitement as I think I ever did and we can have the peace of mind and clear conscience of knowing that we are striving to teach them to love God with all of their mind, soul and strength and endeavouring not to steer their hearts and affections away from God in any way. Just because something is traditional, cultural, I personally grew up with it and society promotes it doesn’t mean it is right. We do teach our children the legend of Saint Nicholas and some of the possible origins of the Father Christmas tales. We also teach them that children from other families believe Father Christmas is true and it is not for them to tell them otherwise. I encourage you to think the issue through, talk it over with your spouse, pray about it, read your bible and come to a decision for your family that is Godly and right.